** International icon, and world famous American film producer, director, animator and entertainer. The brain behind Disneyland and Walt Disney World Resort Theme parks in U.S., France, Japan and China. ** Founder of Walt Disney Productions, which is the best known motion picture producers in the world, with annual revenues of $35 billion USD. Creator of Micky Mouse, Donald Duck and several other popular cartoon characters. ** Recipient of 59 Academy Award Nominations (and won 26 Oscars, including a record 4 in a year) - more nominations and awards than any other film personality. Also, recipient of Congressional Gold Medal in 1968, Presidential Medal of Freedom in 1964, France's highest decoration Légion d'Honneur, and Special Medal from League of Nations. What is Inspiring about Walt Disney Biography? While not necessarily a typical rags to riches story - did you know that Walt Disney started two companies and failed twice, and almost lost his entire business and staff a third time, before finally succeeding with the now famous Walt Disney Productions? Walt Disney developed a love for drawing since a kid, and became a cartoonist for school newspaper in high school. When he later couldn't get work as an artist, he started out an artist company with a friend of his in 1920, when he was just 19. He subsequently had to close it out and started work in an ad company in Kansas, where he developed an interest in animation. Then he started his own animation business. His cartoons, called "Laugh O'Grams", were aired in a local theater, and became quite popular. Disney was soon able to build his own studio, and hired animators, but quickly went bankrupt as he was unable to manage money with all the employee salaries. 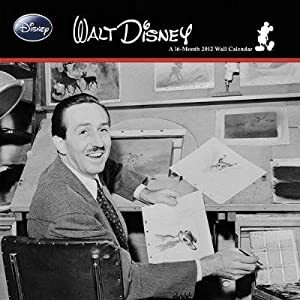 Take Three in Walt Disney Biography - He started another studio, in Hollywood this time, called Disney Brothers, and was able to find a distributor from New York for the live-action animated shorts of his cartoons based on characters from Alice in the Wonderland. These became reasonable success, when the distributor decided to start his own studio, and took most of Disney's staff, along with all the cartoon characters - as the trademark was owned by the distributor - leaving Disney out in the cold. Walt Disney was not the one to be left hanging for a long time, though, and he decided it was time to develop a new cartoon character - and he did it based on a pet mouse he used to have - and the Mickey Mouse was born in 1928. Mickey became the world's most popular cartoon character by 1930, and when he soon started having rivals, Disney put him on the top each time, by introducing color into animation, and partially redesigning him each time. Disney himself personally performed the voice of Mickey for more than 15 years! Disney received his first Academy Award (a special award) for the creation of Mickey in 1932, when he was 31 years old. Soon a plethora of cartoon characters were launched by him, Donald Duck being the second most popular character after Mickey. Disney developed his first full length animated feature film - the classic Snow White and the Seven Dwarfs - against the advice of his wife and brother, who thought this venture would destroy the Disney Studios. When released in 1934, Snow White received a standing ovation from the audience, and became a huge success - and this ushered in the "Golden Age of Animation". Disney went on to secure 8 Oscars (1 regular and 7 miniature ones representing each dwarf) for his effort. By late 1940s, the Disney empire was already booming when Disney envisioned the theme park idea, and the first Disneyland was opened in Anaheim, California, in 1955. The rest, as they say, is history. The Unofficial Guide Walt Disney World 2010 can be quite handy, whenever you plan your next Disney vacation.